Quality Music Press. 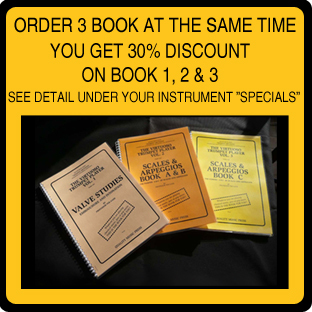 The best books and study material for brass instruments. 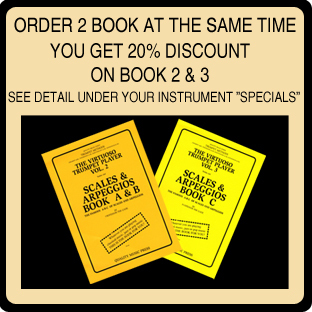 IF YOU WANT TO BE A BETTER MUSICIAN, OR "BE A BETTER PROFESSIONAL MUSICIAN", THESE BOOKS ARE FOR YOU. NB!!! - Please read this! 01. 1A) The Virtuoso Trombone Player. Vol. 1. SLIDE STUDIES. Embouchure and Intonation. Click on picture to read more. 02. 4A) The Virtuoso Trombone Player. Vol. 4. Embouchure Body Building. Book A. 03. 1) SENDING COST: 1 BOOK (ANY BOOK). VALVE STUDIES. Embouchure and Intonation. The Famous A-B-C of Scales and Arpeggios. Book A & B (No. 1 of 2 books). 07. 3A) The Virtuoso Trombone Player. Vol. 3. Book C (No. 2 of 2 books). Book C (No.2 of 2 books).